After their surprise omission last week, Shinji Ono and Tomi Juric started in what feels like will be Tony Popovic’s first eleven this season – although Aaron Mooy was forced off early with concussion. Ernie Merrick welcomed back a slew of New Zealand internationals, meaning Jason Spoonley, Luke Adams and Jason Hicks dropped to bench for Glen Moss, Liam Bertos and Jeremy Brockie at goalkeeper, right-back and striker respectively. An even match, even if the “evenness” came from alternating periods of superiority. The opening twenty-five minutes were constant waves of Wanderers attacks, the majority of which stemmed from their bias towards the right. Inside the first minute, Yousouff Hersi received an accurate cross-field diagonal from Mooy, and whipped a good cross across the face of goal, and the resulting shot was cleared off the line by Bertos. A few minutes later, the Wanderers counter-attacked twice in quick succession, with both moves flowing through the unmarked Hersi out wide, repeatedly finding space to drive past Reece Caira. The bias was accentuated by Jerome Polenz’s manful overlapping from full-back – he frequently broke past Kenny Cunningham’s lax tracking to provide an additional attacking threat, and it probably didn’t help that Caira has only recently been moved to left-back. There was the miscued shot from Ono that originated from a Polenz ground cross, and a moment when he had almost thirty metres of space in front of him to move into, giving him time to pick out Ono in the penalty box. The Japanese was dispossed by Andrew Durante, resulting in a Wanderers corner – from which, rather fittingly, Polenz scored. 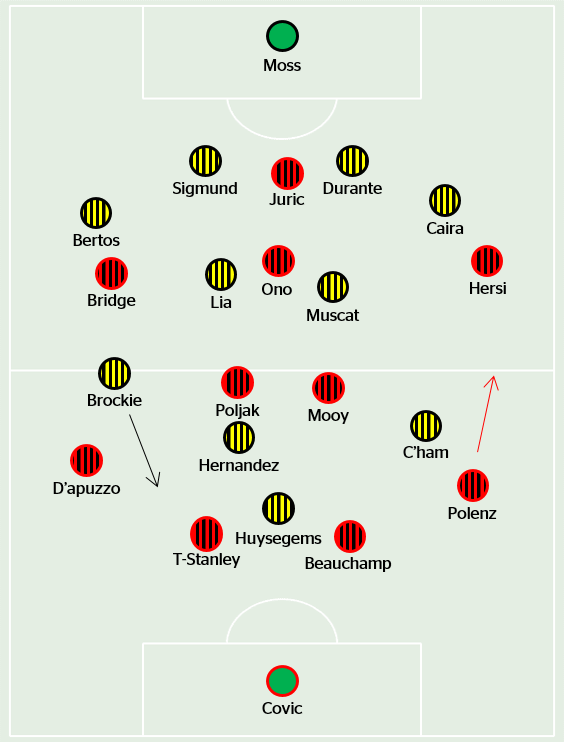 Of Polenz’s fifteen passes in the attacking third for the match, eleven came in the first half – while the Wanderers’ bias to the right is obvious in the graphic on the left. Even before the goal, Merrick might have been considering a change, seeing how easily Polenz was able to break past Cunningham. He elected to make an early change on the half hour mark, introducing Hicks for Stijn Huysegems. The striker was somewhat unlucky to be withdrawn – it was mainly Cunningham’s fault that the Wanderers were enjoying such great freedom down that side, and after scoring last week, he might have felt like he’d earned a longer spell; but with the balance of the side felt better when he went off and Brockie went up-front, as the latter was often vacating his right wing to move into centre-forward positions, often crowding out the area Huysegems was nominally occupying. It’s worth noting that Hernandez intelligently covered Brockie’s position in these moments, so the right flank wasn’t vacant when the ball was turned over – and probably another reason why so many Wanderers attacks came down the Phoenix left. With Cunningham shifting across to the right (where he played against the Roar) and Hicks now on the left, Wellington gained a foothold on the game. Polenz did get forward to curl in a wicked shot midway through the half, but Hicks was keen to quickly pressure him whenever he received possession, forcing him backwards, and gradually the German’s influence waned. Even more importantly, Hicks tucked into midfield whenever the Phoenix had possession, giving them an extra passing option through the centre and helping them retain possession far more easily. That in turn made it easier for the two sitting midfielders, Vince Lia and Manny Muscat, to receive passes facing forwards, thus allowing them to dictate the tempo of the game and work the ball forwards towards the attackers. Carlos Hernandez in particular benefitted from the gradual Phoenix dominance of possession. He often drifted towards the right, finding a pocket of space to link up with Bertos, and mixed clever, calm passing across the final third with more aggressive, ambitious balls forward. He recorded the most passes of any player, but it wasn’t for the want of keeping his distribution ‘safe’ – instead, it was simply indicative of how well he played. At half-time, Cunningham came off for Paul Ifil, and the Phoenix attack became very fluid, with players switching positions in the defensive phase according to where they were when the ball was turned over. Ifil was at his best on the right, producing an excellent turn down the right to create Brockie’s equaliser, and later curling a shot just beyond the far post after giving Adam D’Apuzzo the slip. It took time for the Phoenix to settle into the second half, but the double save they drew from Covic just before that goal seemed a catalyst. Hernandez forced another great save from Covic a few minutes after the goal, and they continued to create dangerous attacks as the half progressed. Tony Popovic reacted by introducing Brendan Santalab for Ono, which saw Bridge move in behind Juric. However, a bigger issue was their trouble playing out from the back – something predicted in pre-season, and evident in last week’s match against the Mariners. 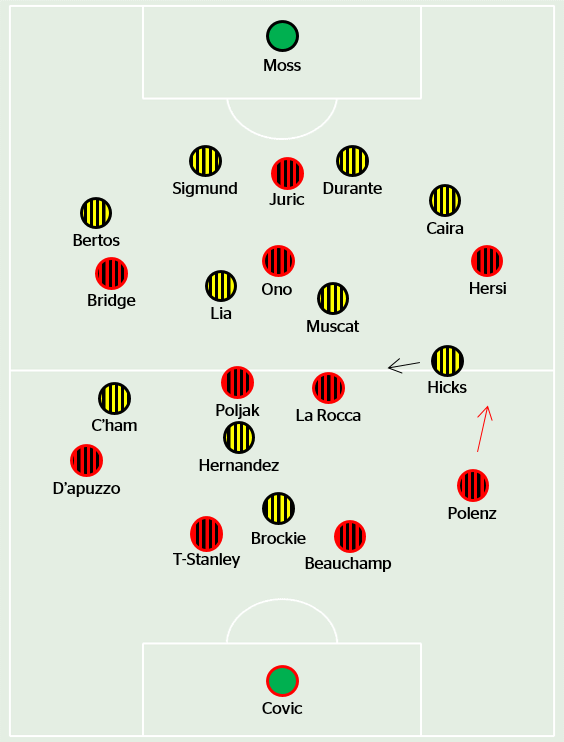 The Phoenix defended more positively than the Mariners – the front four of the 4-2-3-1 pushed high up the pitch, and the two central midfielders likewise pressured their direct opponents. That meant all of the forward passing options were closed down when they received the ball, and twice in the first half Poljak and La Rocca gave the ball away cheaply inside their own half, conceding half-chances. It happened again in the second, and more often than not the Wanderers simply opted to play more directly. The Phoenix were tasked with a similar challenge when they played out in deep positions – as we’ve come to expect, the home side’s front four pushed high up the pitch, with the back six sitting a little deeper. Santalab’s introduction gave the pressing fresh energy, and he hit the post on seventy minutes after dispossessing Bertos high up the pitch. Both sides, in short, lacked composure as they tired towards the final half-hour, and efforts for a winner were created largely from counter-attacks, set-pieces, or long balls: there were few long periods of possession from either side. Merrick’s bold early change helped stem the Wanderers numerous attacks down the right flank – he deserves credit for recognising his side’s weakness, and rectifying it without necessarily negating his side’s attacking impetus. Hicks started on the bench, but was very important to the overall pattern of the match – he drifted into the middle to help the Phoenix control possession, which also allowed Ifil to play slightly higher up on the opposite side in the second half, where he promptly created the equaliser. Tony Popovic claimed to be happy with a point, but after a fine start, he’ll be disappointed his side didn’t build on their early running – and if the intent really is to play out from the back more this season, there’s much work to be done on that front.